There are certain particularities for every web niche. Google has algorithm variations for different markets or languages. The values of the Link Detox Risk calculation may be different from one industry to another. We allow you to customize your Link Detox analysis according to your industry, language or country. This will help you get a more precise DTOXRISK® score. Adapt your Link Detox analysis to a specific niche, country and language. 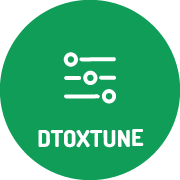 DTOXTUNE gives you the power to adjust particular DTOX rules based on your opinion and experiences, so the calculation of the DTOXRISK can fit your needs even better. You will only find the problematic links which you think are a problem for you. Every niche is different on the internet. Now you can adjust your Link Detox analysis to the complexity of the real world by optimizing every single DTOX rule for a specific country or market. Google uses a different version of their internal algorithm. One backlink can be bad for one industry, language or country, but very helpful for the other. This is why we developed a unique feature in Link Detox: DTOXTUNE. It allows you to adjust the Link Detox Genesis algorithm to your individual needs. And some more goodies in the future! To create your individual setting, go to the DTOXTUNE dashboard and adjust the importance of each of the rules according to your needs. Exclude the ones you think are not necessary. You can also give more or less weight to the other rules. After customizing your settings, you can generate your DTOXTUNE code and share it with other Link Detox users if you wish. Since its launch in 2012, Link Detox has always been transparent with its Link Detox rules. It educated our users on the underlying problems and tactics that were long outdated. It helped users clearly understand why we believe a link is risky so they can make an educated decision to accept or disregard our opinion. We believe empowering you, our users, with transparency is crucial to your success to Recover – Protect – Build. Get a more precise Link Detox Risk assessment by adapting the Link Detox algorithm to your individual needs.